207km cycling event starting from Honeybourne, nr Evesham. Controls at Banbury, Honeybourne HQ and Barnt Green, plus 5 information controls. Second Year of this two loop event. The loops are the other way round this year. The 1st goes across the North Cotswolds to Banbury, the 2nd into the Lickys with a control at Barnt Green. There is catering at the start, middle and end at the event HQ. 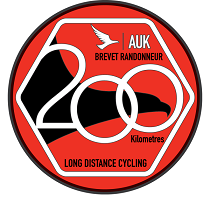 There is entry on the day, but the only way to guarantee a brevet card is by entering prior to the event ether online or by post. Instant verification is now available.